CDCR’s K-9 Unit recently continued its winning ways. Officer Chris Salopek and his dog Taser from Salinas Valley State Prison took first place at the San Joaquin Police Trials on June 29. Officer Robert Bender and his dog Storm from Correctional Training Facility in Soledad placed fourth among the 16 area K-9 teams competing. 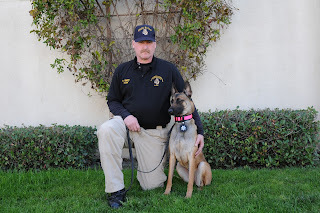 Both CDCR teams have been consistently placing in the top levels of local K-9 trials. The two dogs were donated at no-cost to the department, showing a program doesn’t have to spend $10,000 on a program to get an excellent dog team. Taser, a 2-year old German shepherd, has been in service for about a year. His discoveries have been outstanding. He is cross-trained to not only to detect the odor of narcotics, but also cell phones and tobacco. Taser was donated by Nancy Rynard, owner and operator of Westwood Kennels in Ohio. 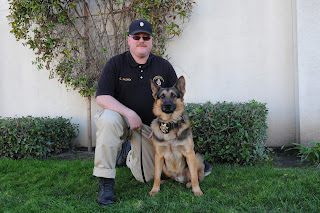 Rynard specializes in breeding and training German shepherds for law enforcement agencies. She heard about CDCR’s program and donated Taser and his brother Max to the department. Max is assigned to Sergeant Jeremy Packard at Folsom State Prison. Taser and Storm took top honors in the Manteca Police Department K-9 trials in April, beating 25 other K-9 teams. See that story in this issue of InsideCDCR: https://inside-cdcr.blogspot.com/2012_05_20_archive.htmll.